I have been itching to try my hand at making Tamales from scratch for a long time. The reason is simple – I love eating them. And like anything that I love, I like to learn to make it at home and teak it to my taste. So, when we choose the Gutsy Menu up for September and Mexican ended as our theme, I could not help sneak in a Tamale recipe to finally force me to try this labor intensive recipe. Dishes that take days to make, hours to compose and unifies family and friends together to create memories is the ultimate reason for why people cook in the first place. 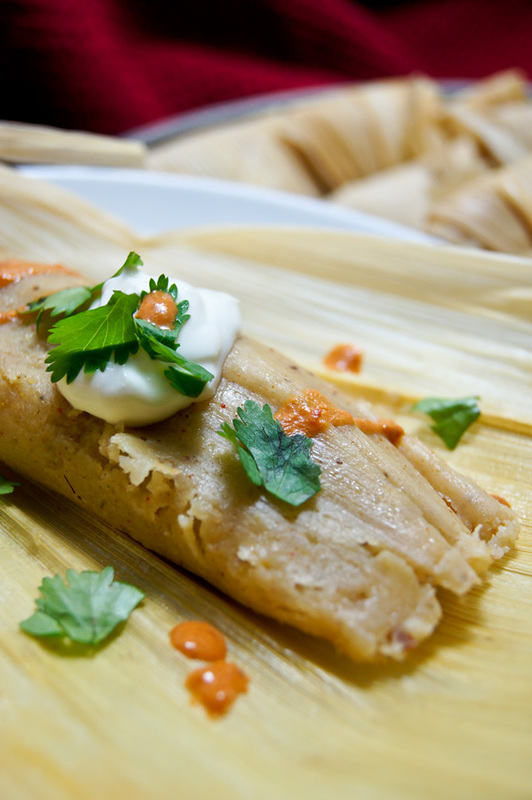 Tamales is a dishes that fulfill all of that. 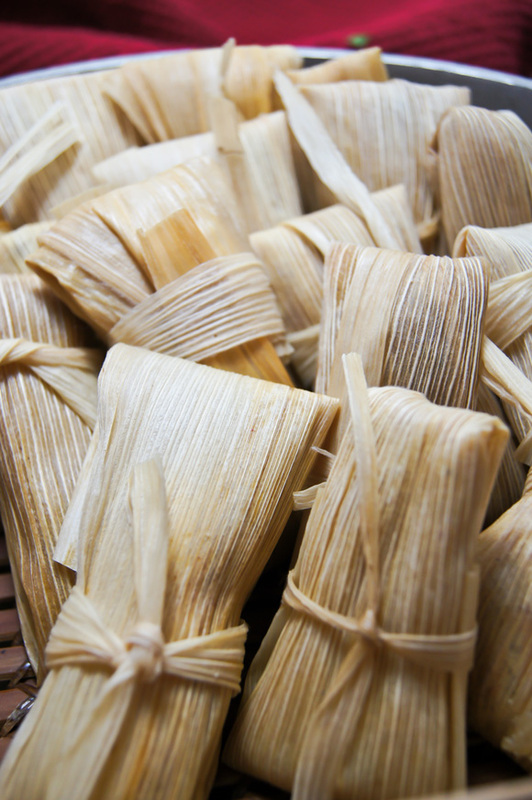 Ask anyone in Mexico, and they will tell you that Tamale making is a labor of love. They vary from region to region as does the process, ingredients and tools used. Almost as much as they do family to family. Recipes (and ingredients) are protected and protocols are followed. In many cases the person making the tamales keeps their secrets to themselves and those secrets are passed on from generations to generation. The other thing that Tamales are? They’re very labor intensive, however not difficult to make. But time is needed to keep your sanity. In most cases you can host a “tamalada” party and invite some friends to help you out in the process, the rewards? Taking tamales home and having a great memory. But, you can certainly accomplish this dish all by yourself. With a bit of planning and breaking the instructions into manageable parts, it is totally doable. Give yourself 2 days for this one. Gather the ingredients and cook the filling on day 1, and then prepare and cook the tamales on day 2. 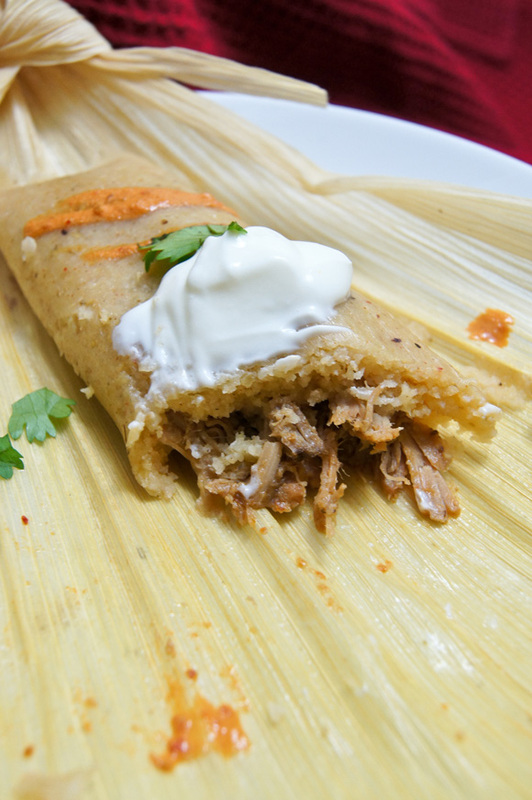 The recipe posted in our line up was Rick Bayles – Yucatecan “Pudding” Tamales with Achiote and Chicken. This recipe had something good and something bad. The good? The fact that this recipe uses banana leaves, instead of the usual corn hunks. And the masa for the tamales is actually cooked - which I guess it’s the “pudding” part of the recipe. The bad? The recipe was made with chicken as the filling. And having had chicken pretty much for the past 4 days, we sort of DID not want chicken AGAIN. Sorry Rick, but your recipe needed to be scratched off. I went on the hunt because I still wanted something different for the filling and instead of finding the one, I was overwhelmed with the amount of choices I had. I simply gave up trying to narrow it down and turned to Tom and asked him what he was craving. I was craving a relaxing weekend. Mmm, me think, I had a problem. Since part of the Gutsy credo is to push out creative limits and to think outside the box, I wanted to figure out how I could do great tamales in one day but at the same time keep as much as the integrity of the process intact. Most of the recipes called for making a filling that would take hours to make, I decided to come up with a short cut for that portion of the recipe, which would shorten the process by a day. I’m lucky enough to live in a city that has a pretty strong Mexican presence, and we have tons of small Mexican family markets around that cook up a storm during the weekend to serve their local crowd. In order to fill Tom’s pork craving I wanted to go with Carnitas for my filling. And I knew I could totally score by driving to my local Mexican market and buying a pound of freshly made Carnitas. If you do not have this option, you can find two great recipes here and here. I also picked up the corn husks; found the Masa that is specifically for Tamales making and the lard. I was so happy that I scored so big, I treated myself to a big glass of homemade Horchata. Back home, I set myself up and started on the process. First up, I soaked the corn husks with hot water and let them stand about 1 to 2 hours, which gives you plenty of time to prep your filling and make your masa dough. Next up, was cooking the sauce for the Carnitas in order to make them a bit more flavorful and moist. I used a ready-made Pipian Mexican Condiment found in my Mexican market to do this and not only did I end up with a wow sauce, it was simple and easy. Last by not least, the masa dough. A good Mexican friend of mine told me that the trick to the tamales is not the filling, you can pretty much fill them with anything. But, to concentrate on making and cooking the masa dough to perfection, which is what makes or breaks the tamale. After eating so many different tamales from so many different places, I knew what my preference was and I wanted my tamales to be light, tender with melt in your mouth masa, as compared to the hard dense, heavy masa that is found in most restaurants. to cream the fat that I was using, which was lard. Making sure to whip it until it double/triples in size. Some recipes use butter and vegetable shortening which is fine to use as well. But, if you find lard, use it. Keep it real guys. seasoning the masa dough. I used chicken broth, which I then spike it with some chili powder to give is an extra deep flavor and a kick. Filling the tamales with enough meat, making sure the ration was in perfect balance - you do not want tons of masa and little filling - that is a no-no in my book. 1 package of corn husks (you will probably have leftovers) that have been soaked, then cleaned and dried. In a saucepan, over medium high heat add Pipian condiment and mix it with the chicken broth. Season with the sugar and taste, adjust if needed. I wanted it to be a bit light, so I also mixed in some Mexican crema (you can use sour cream too). To prepare the filling, add about 1 tablespoon at a time of the Pipian sauce to the Carnitas and mix. Stop when the meat is moist, but NOT runny. Whip the lard and put aside. Add the Masa to a bowl large enough to give you room to kneed it with your hands*. Mix in the salt and baking powder and more chili powder if you want it a bit spicier. Slowly add the warm chicken broth, mixing with your hands until the liquid is absorbed by the masa. Add the whipped lard and continue to mix until the masa gets to a smooth, spreadable consistency. *Some recipes uses the stand mixer to do this, but I prefer to do the mixing by hand because I think the stand mixer makes the dough tougher and something is lost in the texture. Tamale dough is very similar to the dough we, Venezuelan use to make our famous “Hallacas” (which is our version of the Tamale) and if there is anything that I have learned through the years is that mixing by hand and letting the dough rest between periods is the key to having a soft, light dough as your end result. Here is another tip - if you cream the fat enough BEFORE you introduce it to the rest of your masa mixture, the dough will float** as soon as all the ingredients are mixed together. It is MUCH easier to whip the fat before it’s added to everything else than to mix everything once it’s all incorporated. **There’s the magical “cold water test”: after combining the fat or oil (in whatever form), and leavening agent to the masa, drop a small ball of dough in a glass of cold water. If the ball floats, it’s ready for making into tamales. Time to make the tamales by turning your kitchen into an assembly line. You can check out hundreds of videos to help you visualized the following instructions. Start by opening your cornhusk and lay it across the palm of your hand with the small end toward your fingers. Scoop up about ¼ cup of the masa dough with a spatula, and then smear it on the shuck. Cover about left 2/3 of the shuck with masa, leave 1/3 on the right uncovered. Similarly, cover the bottom 2/3 of the shuck, and leave the top 1/3 uncovered. I discovered that doing 5 or 10 at of time and laying them out will make the process faster, specially if you are doing this by yourself. Now it’s time to add the filling. Add a heaping tablespoon of the filling in the center of the masa. Add some more sauce if you want, or even a couple of dashes of hot sauce if you want to give it an additional kick. Now roll. 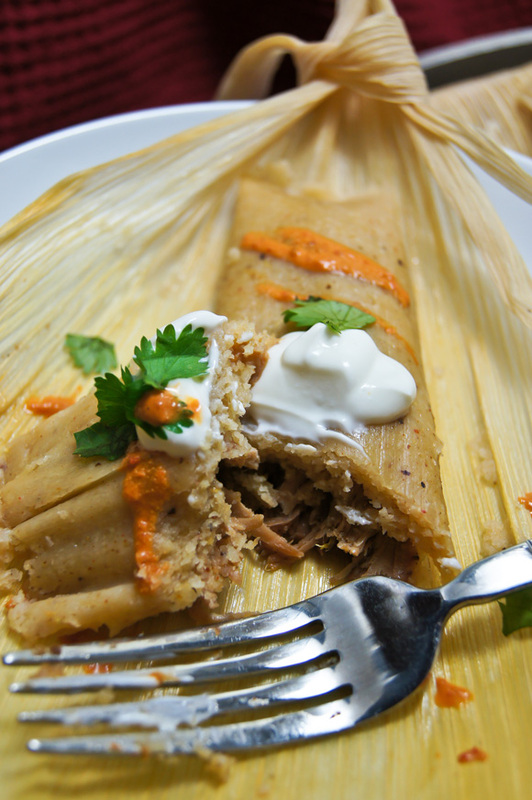 There are several ways to roll tamales, but I’m a fan of the tied-end method. It’s simple, plus the tamales look like little gifts. Take the husk and starting at one end lengthwise start rolling. When it’s completely rolled up, tie the two ends with the masa strips. Y listo! You’ve made a tamale! 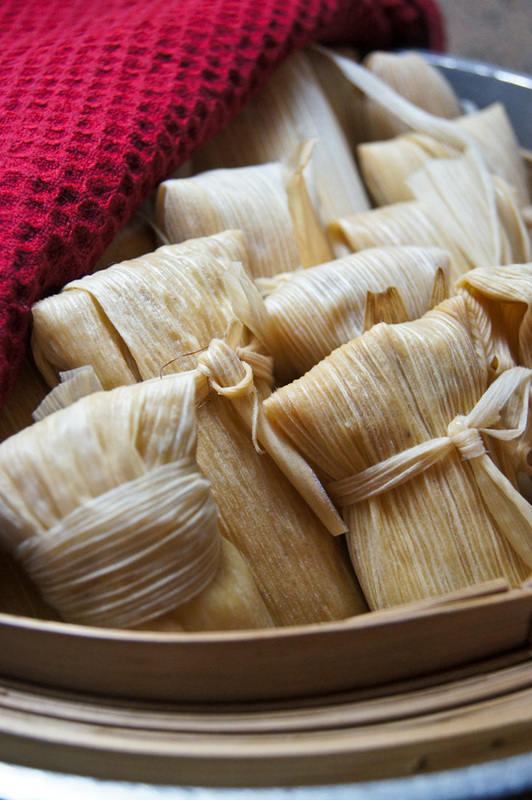 Steaming is simple: take the tamales, and layer them in a steamer basket in a large pot. If you have a bamboo steamer (which is what I had) this works as well. Steam for about 35-45 minutes. The tamales are done when it peels easily away from the husk. Depending on how many tamales you make, you might have to do this in batches. Serve and enjoy. If you make more than 20, you can store in the freezer. Steam frozen tamales for 20 minutes. Congratulations! You are now part of the few, the proud, the tamale cooks! But, all kidding aside, the message here, I guess is that it doesn’t take fancy tools to make tamales. It doesn’t take hard to find ingredients. It takes patience, lots of taste testing, a gentle hand and a dash of love at each stage along the way. We all loved them. I did not make them too big, but the were the perfect size for a good meal. The dough came out like I wanted it, not to thick and not to thin, the perfect ration to the filling, which was moist and a bit of spicy kick. I served it with a gallop of crema, and a couple of dashes of hot Mexican sauce that I got with my order of carnitas. A final sprinkled of cilantro and gobble them up.